From the Acme shopping center in Newtown, go 4 miles North on route 413 (Durham Rd). Turn right into our parking lot, directly across the street from the CVS drug store. Take Route 232 from River Rd. 5.9 miles to Route 413. Turn Left onto 413 (at the gas stations), go 1/10 mile. Turn Left into our parking lot, directly across from the CVS drug store. Take Route 202 North from Easton Ave., 4.2 miles to Route 413.. Turn Right onto Route 413. Go 5.3 miles on 413, just past the gas stations at the intersection of route 232. Turn left into our parking lot, directly across the street from the CVS drug store. 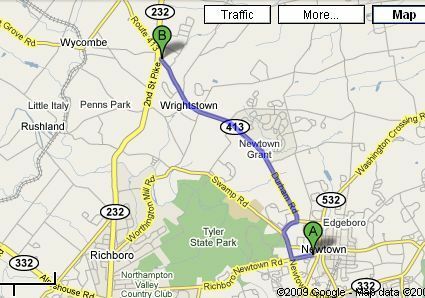 Take Route 413 North to the Newtown Bypass (332/413). Turn left at the Newtown Bypass (you'll see signs for 332 going left). Curve all the way around the Newtown bypass. At the ACME shopping center, turn left onto Durham Rd. (route 413). Go 4 miles on Durham Rd. Take 95 North to the Newtown/Rt. 332 exit. Turn left at the exit (332 South). Go approximately 4.5 miles on 332 (curve all the way around the Newtown bypass). Turn left at Durham Rd. (route 413), at the ACME shopping center. Turn right into our parking lot, directly across from the CVS drug store.